Glad you got them Ok. And agn many thanks for your support. > I am QRVing on 40/30/20/17/15/12/10m bands. > Especially, I worked NA-089 K0AP/5 on 40mCW and 10mCW last weekend. > 2030-2130UTC on 40mCW next weekend. > I am very happy to receive your e-mail. > >What band and frequency would you like to meet me? 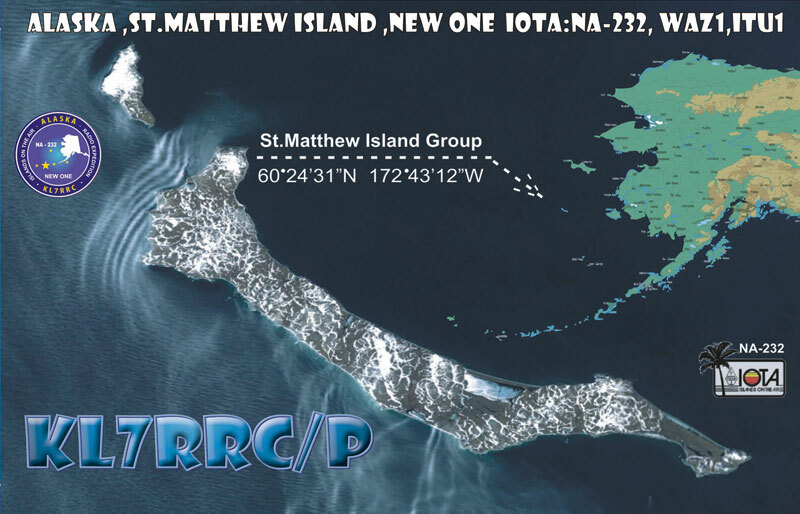 I am glad we were able to provide new IOTA NA-089 to many JA stations. Propagations were great and we enjoyed every bit of it. and speak for ship .I wait info abt 15-20 days. Dragan K0AP, Hector AD6D (XE2K) and Mike AB5EB will make an attempt to activate NA-089. 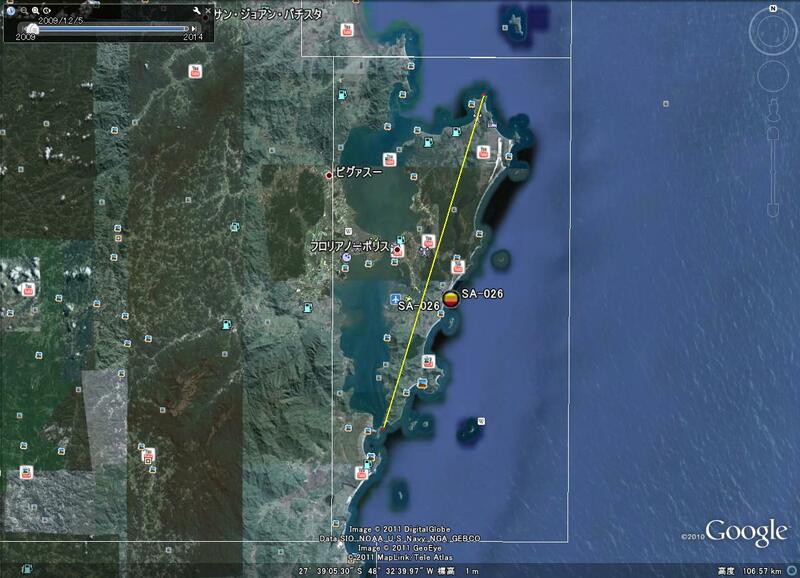 The group will try to land on the island as early as 23z October 14th. They will operate 2 stations with a 3 ele beam and vertical antennas. 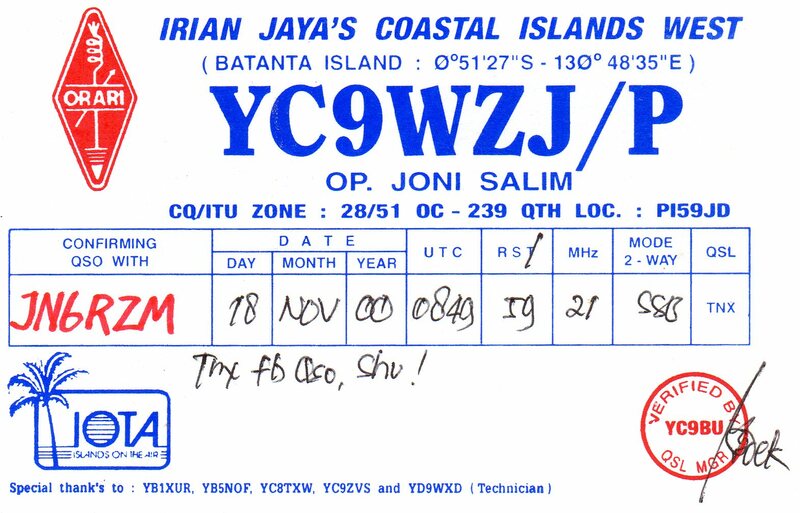 Listen for them from 10m-40m both SSB and CW. The island they will attempt to operate from is called Grand Island also know has Half Moon Island. It is mainly a marsh island with narrow pieces of oyster reefs about 10m wide and up to 40m or so long so space will be limited. The operation will be dependent on good weather. They plan to stay on the island until Oct 16th. I am listening on 7021 now. Did you work K0AP this morning? Just a quick note to let you know that the KL7RRC (NA232) cards are being sent to you today by air mail. 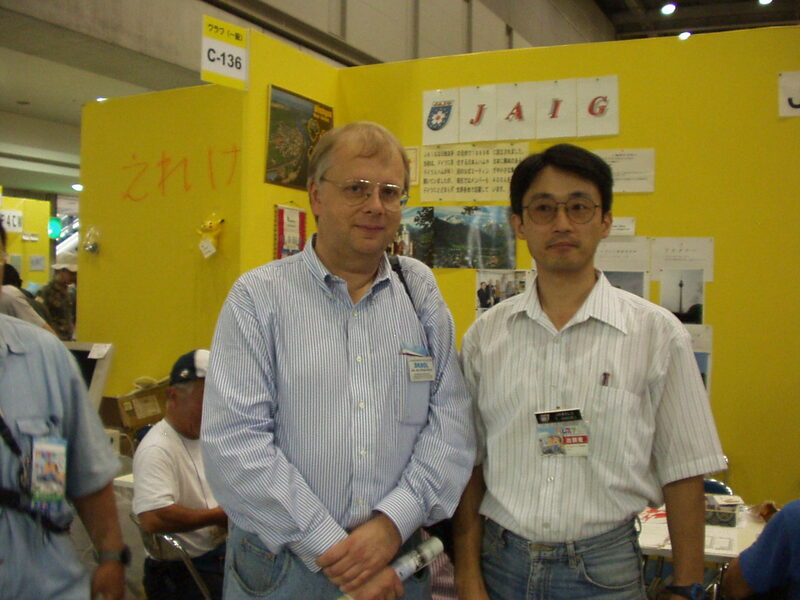 Thank you for being such a great IOTA supporter for Yuri (N3QQ). Your cards are the very first ones going out.. I have short holidays from 8th to 10th Oct. Today is national holiday in Japan. I thanked you fill your MSG in my Blog. My blog has visited by some IOTA chasers of the world. Few visitor said to me " Tell me how about OC-157 Banda Island?" I filled your OC-070 and OC-157 infos in my Blog in Saturday. Anyway, I and my Japanese IOTA friends had supported for IOTA peditioners. 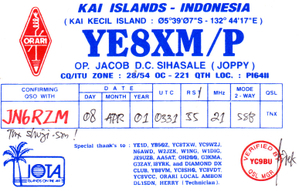 I gathered some donations and contributions for IOTA peditions for YB/DU/KL7 and P29s. 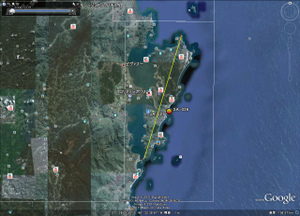 I and my friends would like to make a contact with OC-157 Band Island. I got many information of Banda Island. http://www.travelblog.org/Asia/Indonesia/Maluku/Banda-Islands/blog-130387.htm l If you are possible to Banda, I and my friends will be able to support you fo r financial. 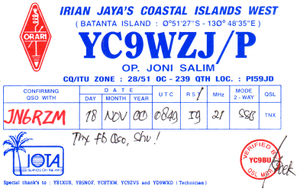 We hope you have plan for OC-157 Banda Island IOTA pedition. Thank you very much for your visiting to my Blog. I am very pleased to filled your comment in it. 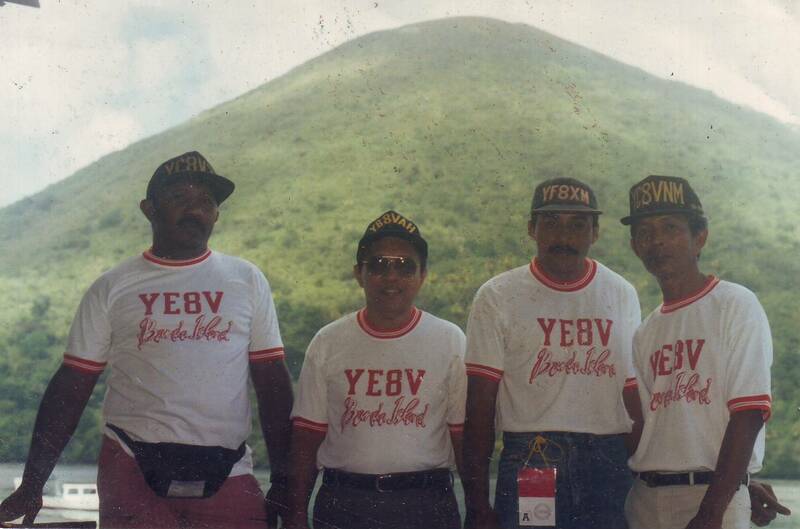 I hope you and YB's IOTA expeditioner will be active for IOTA peditions. 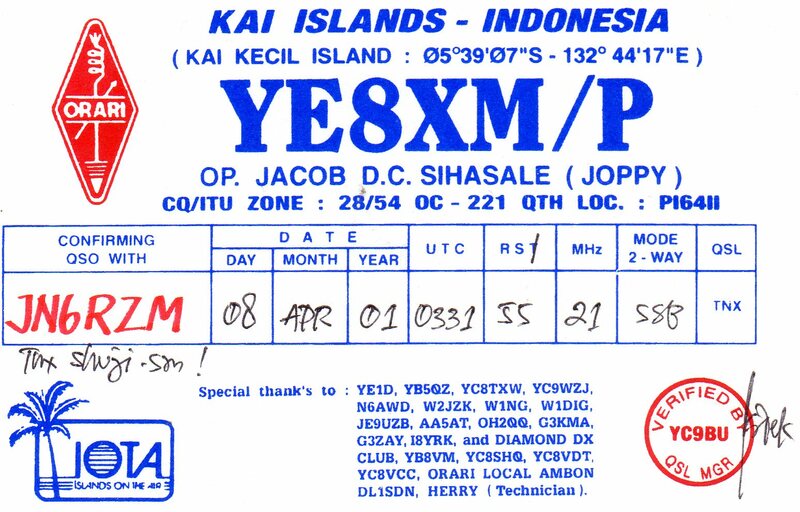 Anyway, I worked Pri YB0ECT/8 on Kai Island. Very happy too. And my friend would like to make acontact with your OC-070. if you like, we can try the sked this night. Last night we could not hear JA on 40m in the northern part of Germany. Currently the other guys had contact on 20m with our 2nd Clubcall DL0DFF to JA. When you are on it is easy to call me via echolink. After dinnertime I can be online there and we can arrange the sked for shortwave. the bands are not open from our Island to JA currently. give you info as soon as we are ready. Have a very nice winter and see you soon on any bands. 連絡者： G4DYO 30 9月 2011. I will try to get a SIM-card for the internet. 彼　I will be QRV from San Andres starting on 5th until 13th Oct.
Daniel, DL5YWM plans to be active as HK0/DL5YWM from San Andres island NA-033 between 5 to 13 October, 2011. Look for him on CW/SSB from 6 to 40m. A detour to Providencia NA-049 will be decided “last minute”.